Tonight, I finished up on reprocessing Galileo images of Io from orbits G7 and G8. I've posted them up on my Galileo Images of Io website. 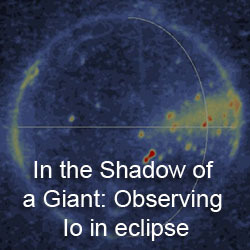 Io images from orbit G7 (early April 1997) consist of three observations covering the leading and trailing hemispheres at moderate phase angles. The images of the trailing hemisphere provided an excellent opportunity of observe topographic features located between 265° and 325° West Longitude. One thing I never noticed before when looking at those two, clear filter images is a split mountain near 23° S, 295° West. Double ridge or split mountains are a common occurrence on Io and include such named mountains as Ionian Mons, Danube Planum, and Mongibello Mons. I should point out that this isn't a new discovery, the mountain is listed in Io After Galileo, for example. I just never noticed it before. It is pretty distinctive in color maps of the area, I just never recognized it as a mountain. 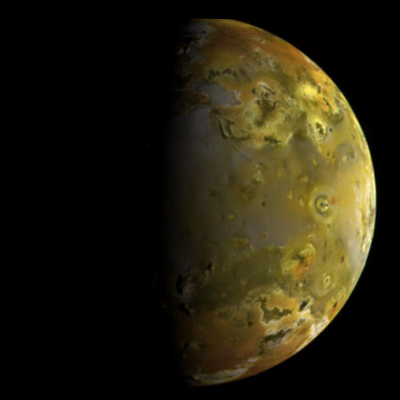 Io images from orbit G8 (early May 1997) rarely see the light of day. Seriously, I don't think a single one was released publicly except on the PDS website as raw images. I guess after the Pillan eruption made all the headlines a couple months later, no one cared about poor old Kanehekili or Prometheus, two plumes seen in the G8 dataset. The G8 images were taken to look at the state of plume activity on Io. Kanehekili and Prometheus are the two most obvious plumes visible, but the Amirani and Marduk plumes are also visible, if you look hard enough at the relevant violet filter images. Starting with G8, I've started a new processing technique for situations where only two filters are available. Usually this situation occurs when only the violet and green filter images were returned in an observation or there is a gap in one of the filters (usually either green or red). In those situations, I am trying out "Voyager" color. In the case where I have only Green and Violet filter images available, I use the green filter for the red channel, the violet filter for the blue channel, and a mix of 61% Green Filter and 39% Violet filter for the green channel to create a pseudo-blue filter image. 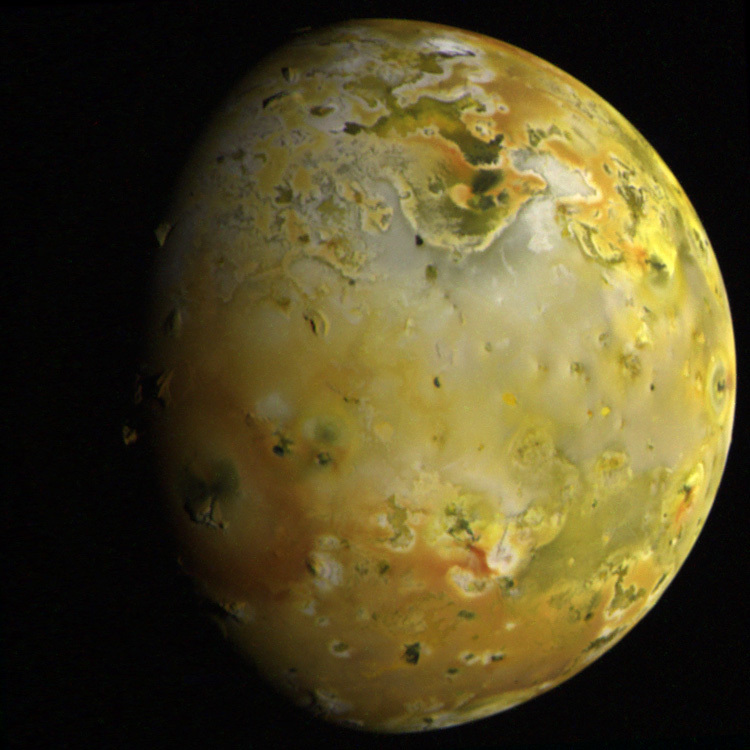 I got those numbers from Björn Jónsson's attempt at creating true-color Io images from the Galileo dataset. I am still processing these types of images the "normal" way, using the green filter for the red and green channels and the violet filter for the blue channel. Let me know which you like better. i want to post an entry about your work here (already added your blog and io images to the sidebar). do you have any favorites you would prefer to be featured on the post? feel free to make specific scientific observations on any as well, but remember the audience is non-scientist. 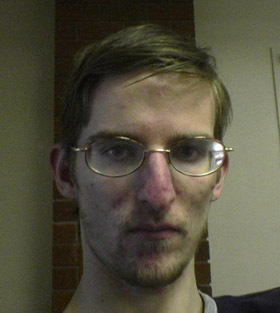 Of the ones I've done lately, I particularly like 32ISGLOCOL01.jpg and 14ISPOLAR_01.png. 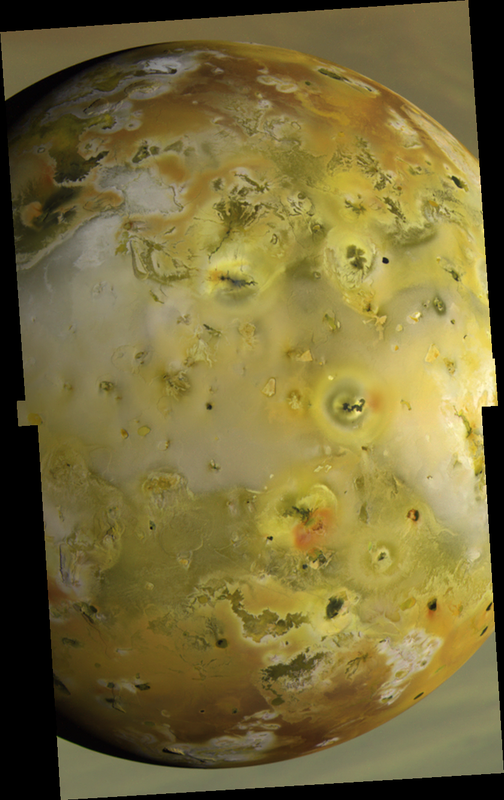 Both of these are natural color images of Io. A few things you can tell you audience: The colors you see in these two images are largely the result of sulfur and related compounds. 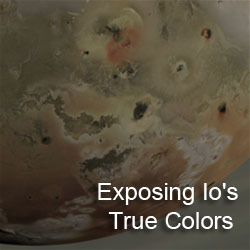 Sulfur on Io produced the general yellowish color of much of the surface. 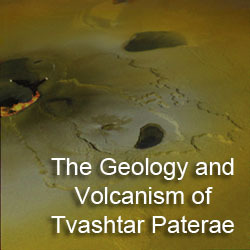 The reddish color of the polar regions is the result of radiation-damaged sulfur. The whitish areas on the surface are the result of Sulfur dioxide: an industrial pollutant on Earth, a frost on Io.